Here is a very early beta of Millénaire for 1.7.2. I'm sure there are masses of bugs, but the very basic stuff works. Please try it out and let me know. Of course, don't use it with worlds you care about! It's working fantastically so far. I will never cease to be amazed at your coding prowess. lurkerwithin wrote: It's working fantastically so far. I will never cease to be amazed at your coding prowess. Thanks, I'll check it out. Any details on when it occured? It's fairly random when it happens. I think it mainly happens when I get too close to the builder. It's a little puzzling, but it hasn't happened in about 15 minutes. EDIT: Never mind, it's completely random. Proximity doesn't matter. Judging by where the error occurs what matters is that the villager in question is active. Being close is not a criteria. If it happens with a specific world, can you post it somewhere? I'll need to reproduce it to fix it. That's a brand new file, but it crashed almost immediately when I entered the village. The crash eventually happens with all villages. It starts off infrequent, then after a while the crashes happen so frequently, I have to delete that world. I have dev mode on and radius of 100. I have CrikCrok's 16th century Norman building pack, LordDamien's Keep, and LordDamien's farm pack. For mods, I have BuildCraft, CraftGuide, Glenn's Gasses, Tinker's Construct, and TMI. Unfortunately I can't load your world because I don't have those mods (and getting them to run in Forge dev mode would be tricky). I'll try and leave a village running and see if it happens to me too. Okay, I think I know what the problem was. Tinker's Construct. I've uninstalled it and I haven't had that specific crash yet. lurkerwithin wrote: Okay, I think I know what the problem was. Tinker's Construct. I've uninstalled it and I haven't had that specific crash yet. TiC is causing an issue? No, it's a Millénaire bug. I was abe to reproduce it. Testing as soon as i get home! 5.2.0 17-03-2014 00:20:07 org.millenaire.common.MLN$MillenaireException: Attempted to create an InvItem for air blocks. Fixed. It was indeed linked to the builder, when trying to place some blocks (doors in particular). The links above point to the new version. Well i found these, i'm not sure if they were fixed in the version you just released or not, since i didn't notice that till now. 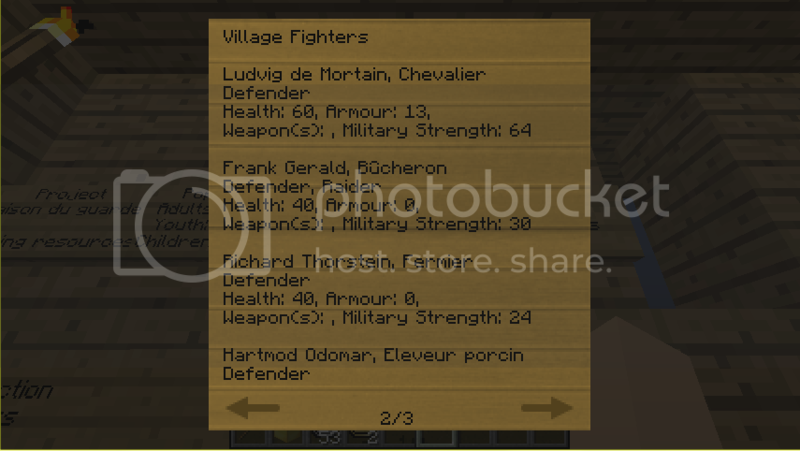 These villagers should have Norman Broadswords and will use them when fighting, but the sign says they're unarmed. For some reason the Text above villagers is missing... All of it. Task, dialogue, names. the dialogue still plays, as it'll appear in chat. This happened in singleplayer mode when i click on the village map. It didn't "Crash" just kicked me from the world, even though it's singleplayer. The world reloads without issues. Just found a new one, it's very minor however. If you are in creative mode and use "Pick Block" on a path, it'll give you a stone slab. The texture for a Byzantine isn't loading it seems. All villagers in a Byzantine village appear this way. In all cultures the lumberman will only chop trees, not replace them. In a Hindi village as shown, the peasants (Male) don't seem to want to work at the Mud brick kiln. I know the cause of the lumberman and kiln ones, should be easy to fix. The ones with the dialogues and the Byzantine textures not showing are weird... Both work fine for me. What version of Forge are you using? For the crash one, I'll need a log. This is the log from seconds before i clicked on the village map. [06:47:06 INFO]: Client> [06:47:06] [Client thread/INFO]: [CHAT] §fNiobe Herodias: I'll be right there, Teethdude! I think I know that crash. It's a large village? Actually the village was just spawned, i tried it in multiple village types. Got the same bugs as teethdude: Byzantine skins don't work and text above their head are not showing. Occurred both with latest 1.7.2 Forge and the recommended version. I use only Millénaire. Also, here is a little request: Could you add the new types of wood as grove spots and useable blocks? Otherwise its working fine, I did not stay at one village for a longer time though. I'm using the latest Forge, not the recommanded one. Can you try with that one? the world shut down, when i try to open the village map in main building. That happens in every village i try. I have the same problems that the other people, the Map Crash, the lack of dialogs and names above the villagers and the lazy men in the Indi village. I've just put up a beta that fixes the problems listed above. For the map issue, you need the latest Forge, not the recommended version. Japanese, and possibly others, have a hard time planting Rice. They keep trying but the land never gets Tilled first. 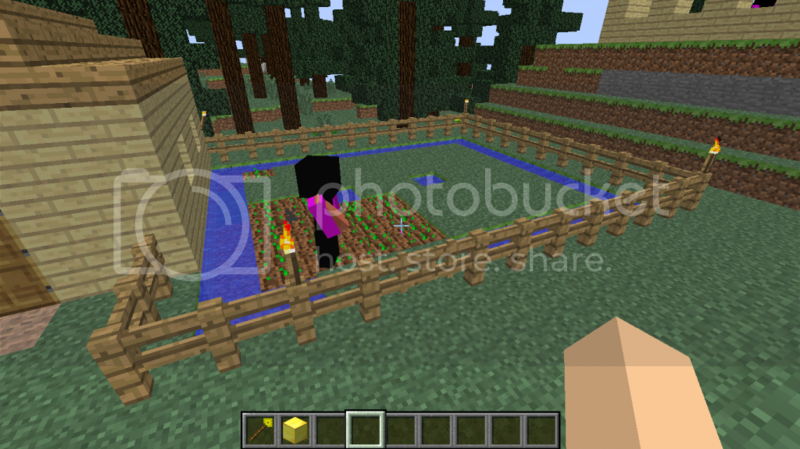 EDIT: The land is tilled, but the rice can't be placed on it causing an infinite loop of them trying to plant it. It's minor, but the villagers never want to use any obsidien Tools/weapons. Not even the Mayans. People don't seem to wear Norman armor properly. He should be wearing a helmet and leggings. It still adds to his armor points on the military sign however. Got a crash from clicking on the "Project" sign in a Controlled Norman Village. The project sign is the one that allows you to toggle if a building is to be upgraded or not, for other players to know. When a new village is located or some other event happens which usually has a coloured message in chat, only the first line of the text is coloured, the rest is displayed white. In the Millénaire settings is 'oui' and 'non' instead of 'yes' and 'no' in English settings. The Byzantine multi-layer skins still don't work for me sadly. Ticlon wrote: In the Millénaire settings is 'oui' and 'non' instead of 'yes' and 'no' in English settings. 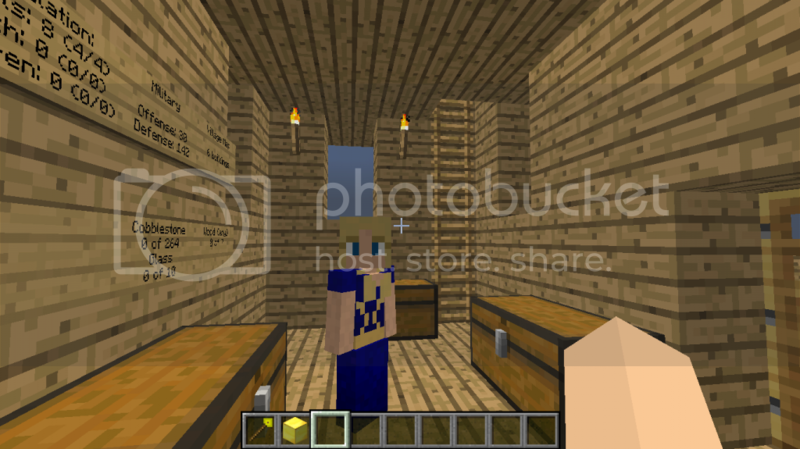 That happens to me in MC 1.6.4, Millenaire 5.1.11, so not a 1.7-specific bug. They work for me now, are you using Forge 10.12.0.1047? Here is what I meant with coloured messages. As you see: the 'South' is white as the rest is grey. Hmm bizzare that the textures do that for you..
My only thought is that maybe they fail to load sometimes, and i've just been lucky that it didn't happen yet. Ticlon, are you sure you are using the latest test release? That Byzantine thing was a clear bug I fixed in the public beta. Found out what I did wrong. Changed some files in the 'millenaire' folder and therefor did not replace it with the 5.2b1 one. Oops! Works fine now. i think this is a bug or just an annoyance when I do the alchemists quest. I accept the quests from the alchemists and I have to go and get my tools from his assistant. The assistant doesn't give me any tools and somehow I magically completed the quest already. and when I got to the quest where im exposed to dig a hole to bedrock yet again he doesn't give me anything. Then im not even able to turn the quest in. Oh and I almost forgot to say this world is set to no cheats and on survival so I don't know why he isn't giving me items. 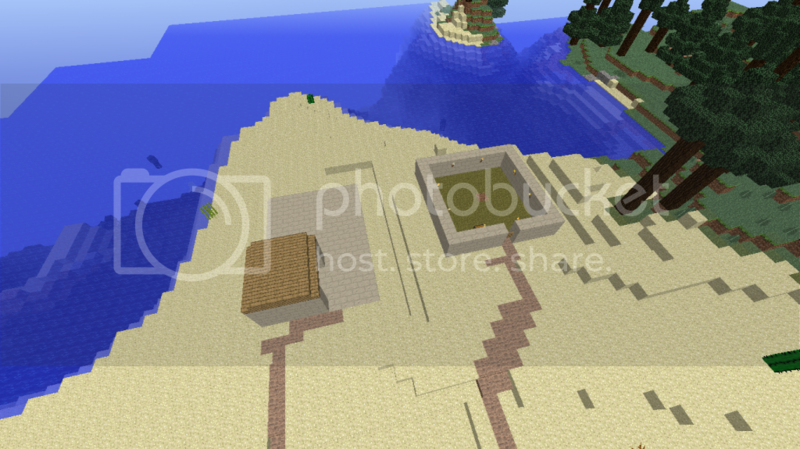 also I don't know if this is anything but when I created a new world on creative no villages spawned except Japanese. I searched the whole map 2 block by block row by row and only Japanese villages except one Norman village who's trader wouldn't let me buy anything and it wouldn't sell anything. and I found the alchemist tower but only the tower and the house spawned but there was no alchemist or anything. I also found this one as I was exploring on a different map as soon as I found a village the game crashed and I kept retrying on a different world and every time I found a village that spawned it crashed. I was just wondering n the village crash if I messed up the install because I deleted it and downloaded it but when I did the game wouldn't even load as soon as I created a new world it crashed. plus is there something I have to do with that java symbol where millinare.jar should go should I extract it or something I just wonder if that's the thing that's causing crashing. these are the last of my crash reports if they are not caused by this just wondering if you could help me solve them. well im sorry I forgot to add something's things I might run out of room plus my crash reports I could only upload 3 at a time and I had 6 to upload. 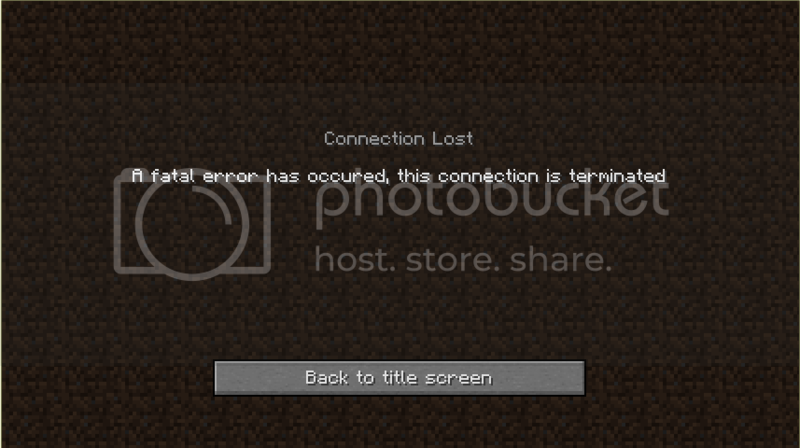 I attempted a brand new server installation with Minecraft 1.7.2, forge-1.7.2-10.12.0.1025 and MillenaireServer5.2b1, but the game crashes right from the start (before even generating the world). [15:03:08] [Server thread/INFO] [FML]: SRV org.millenaire.common.MLN$MillenaireException: Attempted to create an InvItem for air blocks. [15:03:08] [Server thread/INFO] [FML]: SRV org.millenaire.common.MLN$MillenaireException: Trying to get the name of an invalid InvItem. [15:03:12] [Server thread/INFO] [FML]: SRV ERROR: Culture: byzantines: uk: In dialogue file /home/minecraft3/./mods/millenaire/languages/uk/byzantines_dialogues.txt the following line is invalid: 1, 0, Agapo ilioloustes meres! / ? ????? ??????? ???! [15:03:12] [Server thread/INFO] [FML]: SRV java.lang.NumberFormatException: For input string: " 30"
[15:03:12] [Server thread/INFO] [FML]: SRV ERROR: null: Error when reading reputation line in file /home/minecraft3/./mods/millenaire/languages/uk/byzantines_reputation.txt: 4 * 64; ?????? ????? ; ???????? ????? ???? ????? ????? ?? ???????? ?????. : For input string: "4 "
PS: I run my Minecraft servers under Unix (FreeBSD). There seems to be a conflict with Flan's mod. When you press play, the screen goes black then disappears as normal, but instead of Minecraft popping up, the launcher reappears. An error report doesn't pop up either, which is odd. Otherwise I'd send the crash report. It's not a big deal seeing as I don't use the mod anymore, but I just thought I'd let you know. There is also a conflict with Archimedes mod, when you open a world all the characters (even if you aren't near a village) start spamming the chatbox with "Error in onUpdate(). Check Millenaire.log." I just discovered that rice will not plant, at least not in Hindi villages. I tried to plant it in the garden myself, but the rice did not register in the soil. Last edited by Ghost7068 on Sat Mar 29, 2014 5:12 pm, edited 2 times in total.